Water is a precious resource, which is imperative to the functioning of primary industry, including agriculture. South Africa is a water scarce country, being the 29th driest country in the world1. Although there are areas in South Africa where there is plenty of rainfall, it is not always consistent, and therefore cannot be fully relied upon to always provide water to meet the need. It is important that all users of fresh water, the agricultural industry being a significant one, are responsible in ensuring the effective and efficient use of the available water. Pasture-based dairy farms use large amounts of water for livestock drinking, washing the dairy machinery, bulk tanks, facility and yard, and, predominantly, for irrigation of pastures. Irrigation water is used to produce grass which is converted into milk by the cows which graze on the grass. The more efficiently this process takes place, the better value for water, in the form of milk production, there will be. There are very many factors which play a role in pasture growth, some of which a farmer has no control over, e.g. climate and soil type, and others which the farmers can influence through management practices, e.g. soil health and irrigation efficiency. 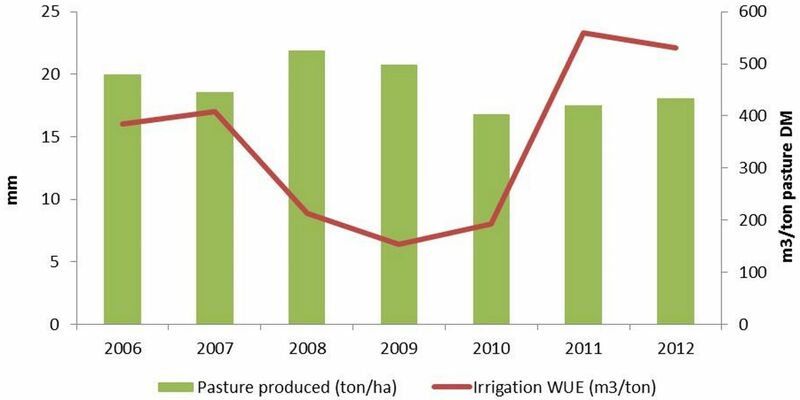 Two of the management practices which greatly influence pasture growth are irrigation and fertilisation efficiency. These two practices are important to sustainability. As mentioned earlier, water is a scarce resource which needs to be used efficiently to ensure maximum productivity from what is available. Fertiliser strategies are important as they greatly influence soil health and inefficient fertilisation can cause water pollution. Sustainable agriculture requires the responsible use of natural resources, such as water and soil, which ensures the long-term health of these resources. Fertiliser application is also costly, therefore if the farm is to rely on chemical fertiliser for pasture growth it will not be productive and efficient indefinitely into the future. In order to explore the relationship between, and influence of, rainfall, irrigation and fertilisation on pasture growth, we have looked at relevant data from a farm in the Oyster Bay region of the Tsitsikamma, Eastern Cape, South Africa. This farm has collected comprehensive rainfall, irrigation, pasture growth and fertilisation data over the last eight years, allowing us to see the changes over time in water use efficiency and pasture production. Water use efficiency can be measured in various ways, but in this context we measured the irrigation water-use efficiency of the farm by taking into account the rainfall and irrigation water applied, accounting for water loss through evapotranspiration, and comparing it to pasture production. This gives an indication of how efficiently water was used to be converted into pasture. This irrigation water use efficiency is measured in m3 of water per ton of pasture dry matter (DM) grown. One of the most notable things in Figure 1 is that rainfall is not very consistent. The average rainfall over the seven years was 1069 mm/year, with the minimum being 723 mm in 2008, and the maximum being 1500 mm in 2011. The water-use efficiency figure is directly related to the amount of rainfall in the year, which when looking at Figure 2, can be explained by the fact that there is nowhere near the variation in pasture production as the variation in rainfall from year to year. 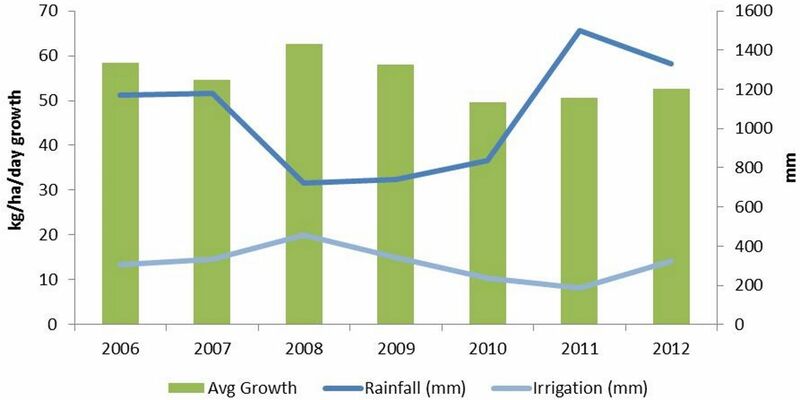 Figure 3 shows that in years where there is lower rainfall, irrigation can be used effectively to ensure good pasture production. Rainfall that drains below the depth of plant roots and that runs off because the soil is saturated and can no-longer hold any water, cannot be used by plants. The portion of rain that falls until this saturation point, which is stored in the soil and is available for plant use, is called effective rainfall2. One of the reasons for such great variation in water-use efficiency over the various years in this case study is that there is such varying rainfall between different years and only a certain amount of rainfall water can effectively be used, where after any more rainfall becomes ineffective. The higher the rainfall in a short period of time, the more water there is that is not effective. Unfortunately, the effective rainfall could not be calculated in this case study, as daily rainfall data is needed in order to calculate it, which was not available. Figure 4 shows the amount of nitrogen fertiliser which was applied on the pastures. This allows us to see that there is another influence on pasture production, which further influences the water-use efficiency. The farm has drastically decreased the amount of nitrogen fertiliser which they have applied over the last seven years (577 kg/ha in 2006 to 262 kg/ha in 2012), with an associated slight decrease in pasture growth. 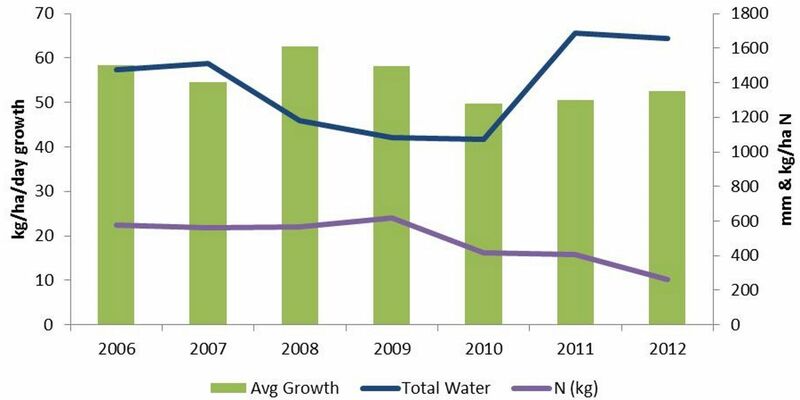 It is interesting to note though that average pasture growth has started increasing from 2010 to 2012, with a continuous decrease in nitrogen fertiliser. This is indicative of restoration of soils to healthier states, which are more able to naturally cycle and provide nutrients to the plants. Soil health is linked to water-use efficiency, in that healthier soils tend to have a better structure, which means a better water-holding capacity. A better water-holding capacity results in a larger amount of rainfall being effective. This provides an opportunity for farmers to improve their water-use efficiency by focussing on effectively irrigating their pastures, taking into account the soils improved ability to store water for longer periods. A farmer has no influence on the amount of rain which falls and the intensity of this rain, therefore their opportunity is in maximising the use of all rain which does fall. This is done through capturing this rain effectively in the soils, and in dams, and then using this water efficiently through good irrigation practices. Figure 5 shows pasture growth and nitrogen fertilisation data from the dryland pastures on the same farm where the irrigation data is from, along with the rainfall figures. 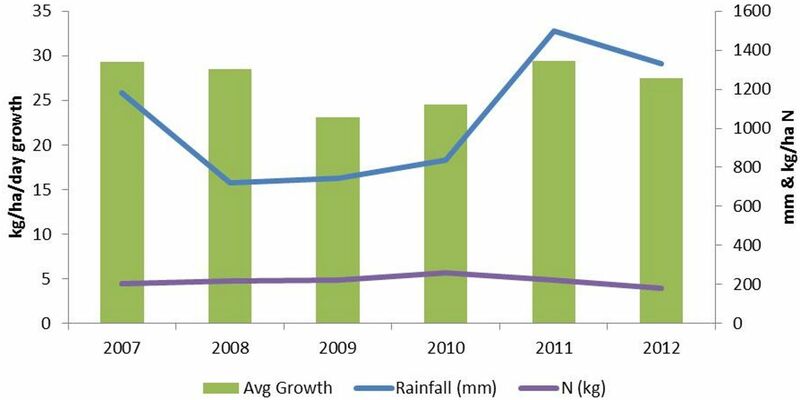 It is interesting to note that the rainfall has a much greater influence on the average growth rates each year, irrespective of the fertiliser applications. 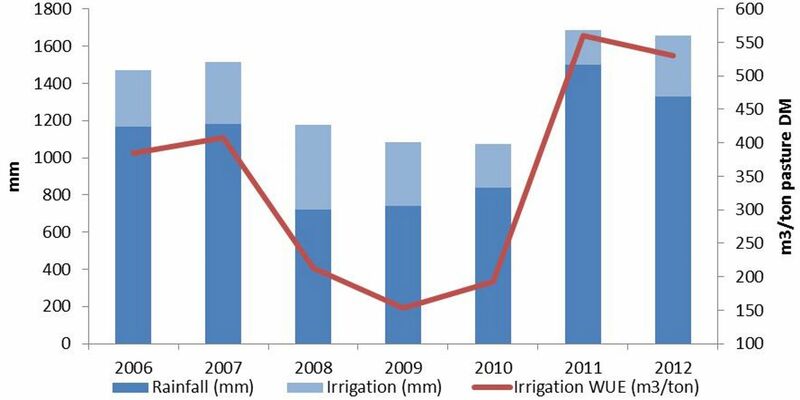 The great difference in growth rates between the irrigated pastures (average growth of 55.2 kg/ha/day from 2006 to 2012) and drylands (average growth of 27.0 kg/ha/day from 2007 to 2012) should be noted, especially in realising the significance of effective irrigation practices. This is obviously relative to the area. Dryland pastures perform very well in some areas, making irrigation unnecessary, and in other areas water for irrigation is just not available and so dryland pastures are the only option. In sustainable agriculture, emphasises is placed on lowering costly external inputs, while maintaining yields through good management practices. This leads to more efficient production, and less reliance on external, non-controllable influences, while focusing on the protection of natural resources. Efficient water use is central to this idea, as adopting effective irrigation practices will help lower water and electricity costs on the farm, while maintaining good pasture growth. It will decrease a farm’s reliance on large amounts of water, which is not consistently available. It will ensure minimal water run-off from the farm, including leaching of minerals which pollute ground and surface water sources, therefore contributing to protection of the environment. Muller M, Schreiner B, Smith L, van Koppen B, Sally H, Aliber M, Cousins B, Tapela B, van der Merwe-Botha M, Karar E & Pietersen K. 2009. Water security in South Africa. Development Planning Division Working Paper Series No. 12. Development Bank of Southern Africa. Brouwer C & Heibloem M. 1986. Irrigation Water Management: Irrigation Water Needs. Training manual no. 3, Land and Water Development Division, Food and Agriculture Organization of the United Nations, Rome, Italy.